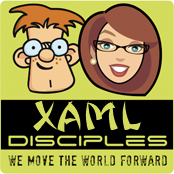 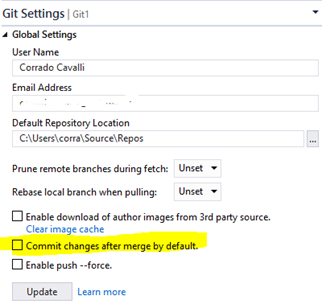 In previous article I showed how to take changes from a branch into parent branch, visually we could imagine this operation like “copying” some files from a directory into his parent, but what if, while acting on a branch a colleague working on another branch fixes a bug or add a feature we need to get asap? 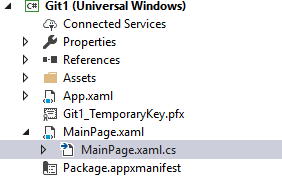 What if we need to “copy” some changes from parent folder into the one we’re working on at the moment? 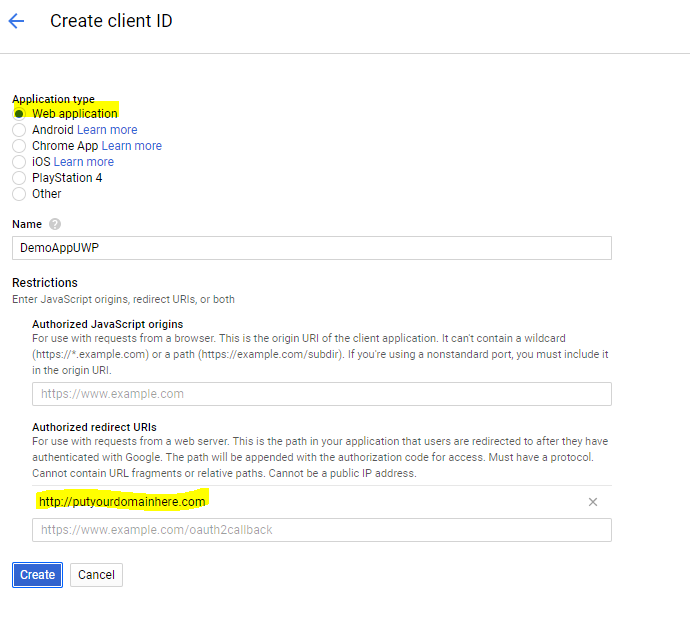 Let’s commit this change and checkout the dev branch created in the past article, we’ll see that MustHave.cs class is not present, how can we have it, together with any related change happened on Master branch since we initially created the dev branch? 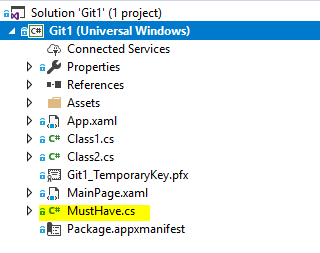 Click Rebase and you’ll now see MustHave.cs class being listed into the project, so basically we can think Rebase being a sort of reverse Merge, a really nice to have feature especially when multiple people are working on different branches. 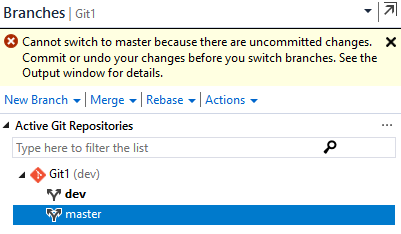 Cool but: We have included ALL changes, including maybe some that could conflict or break the branch we’re working on. 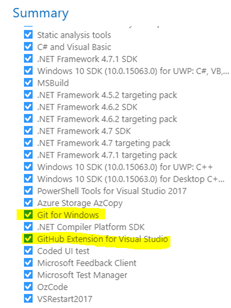 What if I need to take just one or more commits, maybe from different branches, because very critical for what I’m working on and ignore the others? 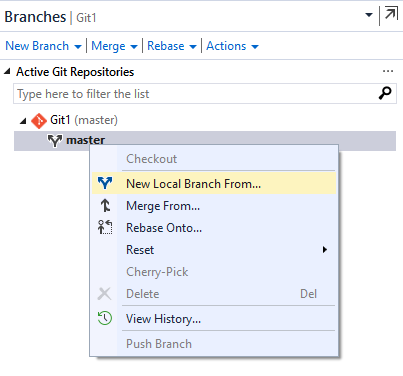 Cherry-Pick is the git feature we need. Let’s do the same with commit b46c2419, we will get a similar confirmation message, and the history of dev branch will now include both cherry-picked commits. 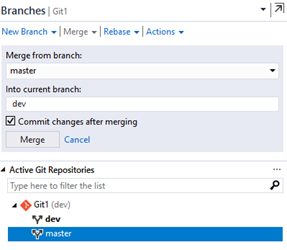 As you see, git offers several option for mixing and matching code residing in different branches, of course all have to be treated with care since the risk of overwriting changes is always around the corner. 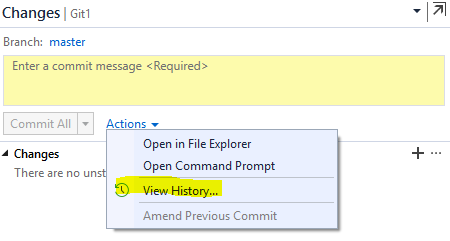 In this post we’re going to talk about History. In the previous post we saw how to commit changes so that git can track them, but without an history browser this list of changes wouldn’t be available and we couldn’t do anything regarding commit history. Git of course let you see all commits history and so the Visual Studio Plugin of course. 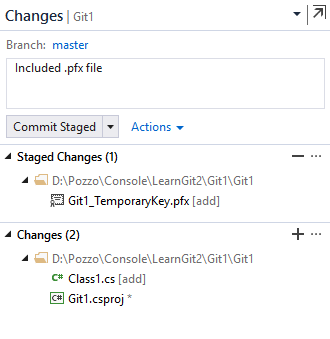 Let’s now add a new Class1.cs file to our project, commit the change, then let’s add a property named P1 to the same class and commit the change again. 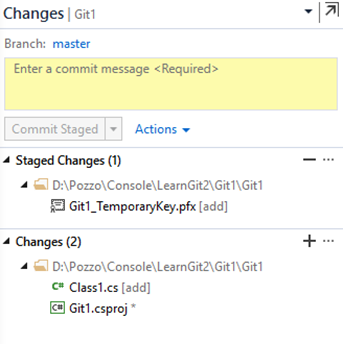 One of the interesting features of history is that we can see what has changed in each commit, just select a commit entry, right click it and select View Commit Details, the Team Explorer tab will change to Commit Details and will show all files involved, in our case just Class1.cs. 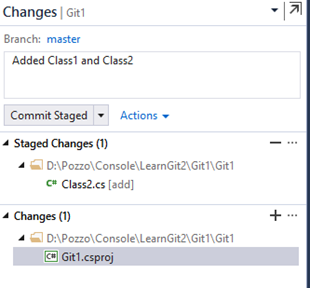 Double click the Class1.cs and a diff viewer window will open showing what has changed compared with latest commit in our case we’ll see that property P1 has been added. 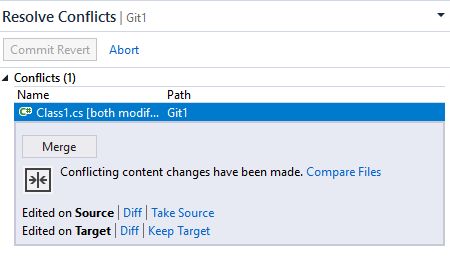 If you want to compare two specific commits instead just select them and click View Commit Details. Another interesting feature is Reset, with this option you can delete a series of commits and rollback to a specific point in history. 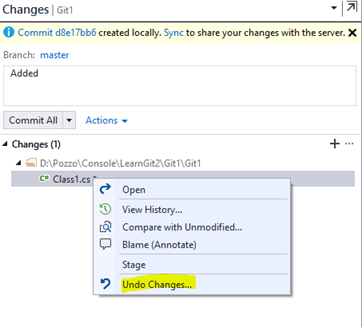 Right click the commit you want to reset to, select Reset and select Delete Changes, this will remove all changes committed after that point resetting your project to that exact moment. 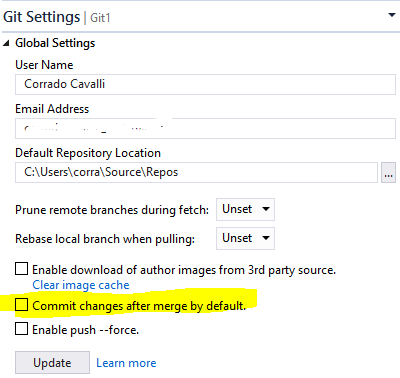 Reset will remove all changes, including any file added that commit, so use it with care because your job will be definitely lost. In my case the Reset Hard operation deleted the Class1,cs file from both the project and the disk. under Reset menu there’s another option: Reset (Keep Changes). 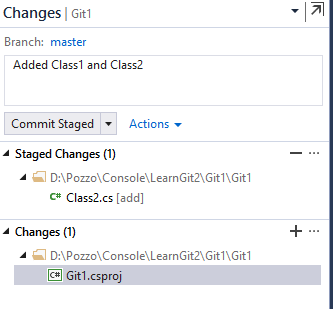 After last Reset Hard I’ve re-added Class1.cs, committed, then added P1 property again and committed, putting the git history in the same status as it was before the Reset operation. 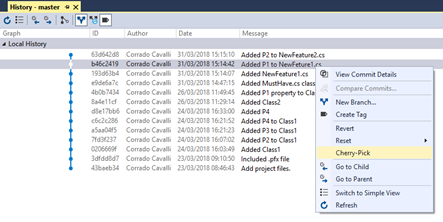 If I now right click commit with Id 0206669f and select Reset (Keep Changes) it looks like that nothing has changed since both Class1 and P1 are already there and if i add a new P2 property and I commit I see history changing appropriately and Class1 contains both P1 and P2. Still not totally clear to me honestly, comments welcome. 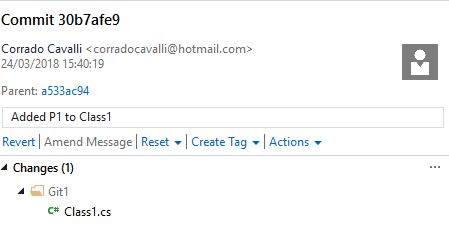 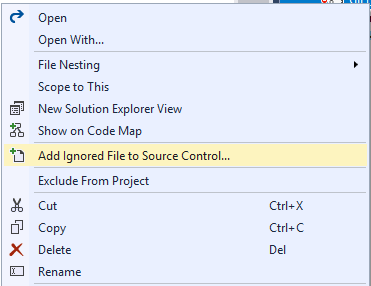 If you want to delete a specific commit your can right click it and use Revert. 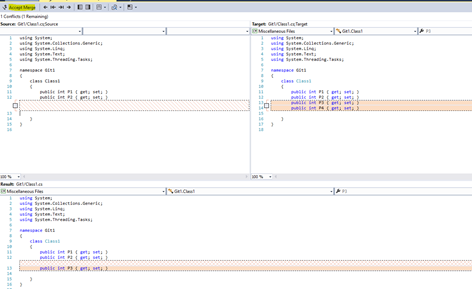 Click Accept Merge in the upper left corner and P3 property will be no longer present in Class1. 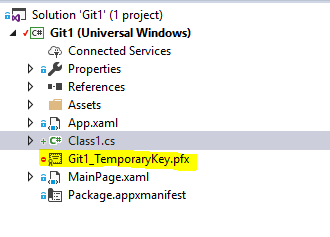 What if you want to undo some modification did to a file returning it to last commit state? Just go to Changes tab, right click changed file, select Undo Changes… and you’re done. In the previous post we learned how to connect a solution to Git source control, we’ll now pay attention to the status of each file inside the solution. Note: This is my personal definition, git uses a different terminology, but you got the point. 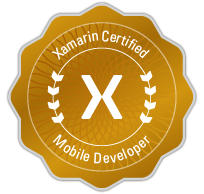 Both Class1 and .pfx file are now tracked, meaning that git knows about that but it hasn’t started recoding changes because we have not commited them yet. Stages changes are a way to control what files are part of a specific commit, and are an alternative to a “general” commit where we commit everything that has changed. 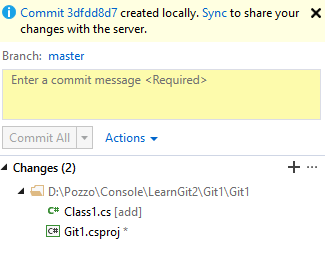 Ok, let’s now add another class (Class2) to our project, let go to Team Explorer window and let’s add a commit comment, we’ll se that button has a Commit all text where we can commit everything that has changed in one shot. 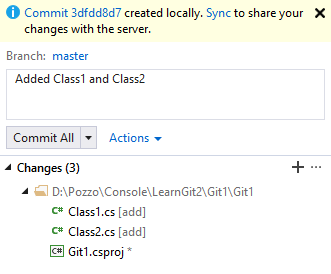 Ok, but what if i want to split committing of Class1 to commit of Class2 for better separation? Just right click the Class1 file and select Stage, add a comment and click Commit Stages, only Class1 addition will be tracked into history. and the previous commit will be updated with both Class1 and Class2 changes. 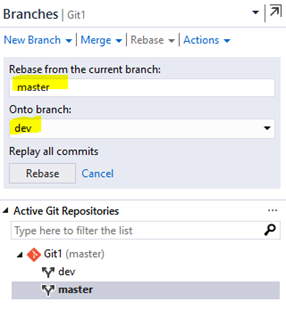 Most of the times I don’t do such granular commits, but since you can revert to a specific commit entry having using this option can help you track precisely the evolution of your app. 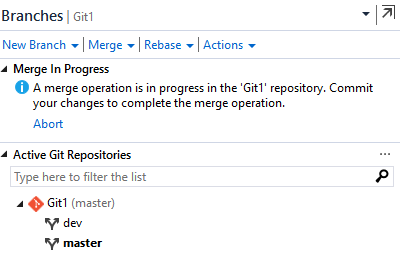 As the vast majority of you i use Git as source control management, and, as many of you, I use it everyday but I feel that I’m just a basic user, so when something goes wrong or I just need to do something more ‘advanced’ i get lost very easily. 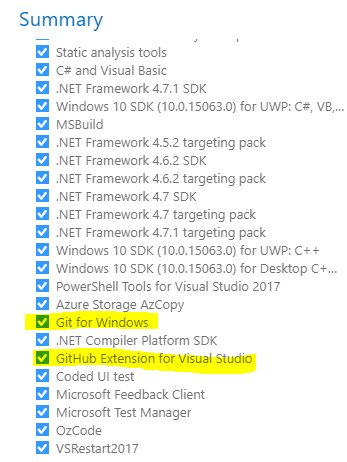 Another thing that differentiates me from those geeky developers is that I don’t like using command line to interact with Git, but I prefer to use the same tool I use everyday: Visual Studio. 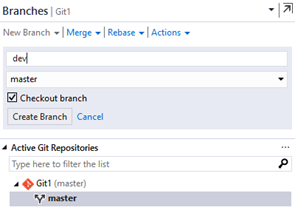 This series of post are nothing more that my tentative to take some basic notes of my daily Git use as basic user. 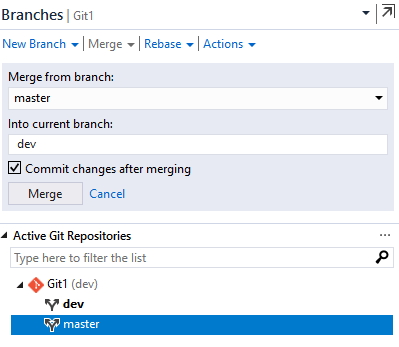 There is a lot of documentation around Git, in case you need more detailed info, at this link you will find a comprehensive guide. 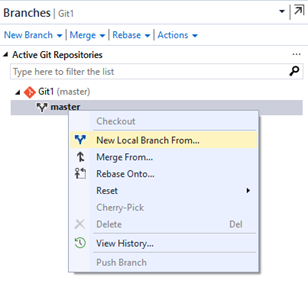 -Git is more than a simple source control system. 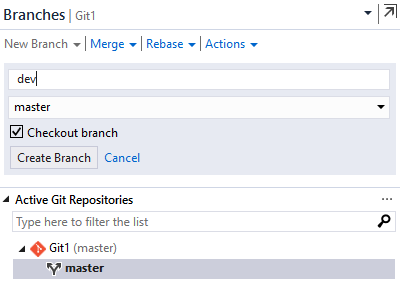 -Git is a decentralized and serverless. 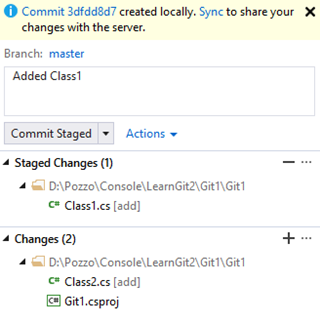 Regarding 2nd point: It means that Git doesen’t require you to have a steady connection to a server, in fact you might even decide to not have a server at all and, in case of more developers working on the same code, they work with a local copy of the code and, when they decide to, they can sync their copies and this sync operation might lead to conflicts in case two or more developers changed the same parts of code. 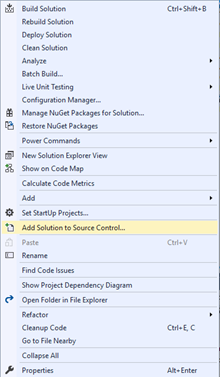 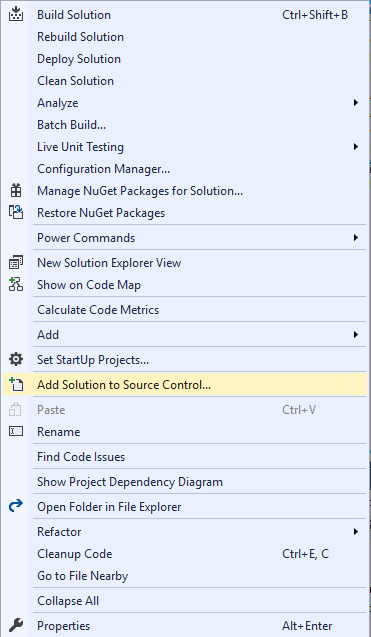 When we create a new solution with Visual Studio, if we want to use source control with it we need to ‘add it’ to a source management system, Git in this case, since Visual Studio won’t do that automatically for us. 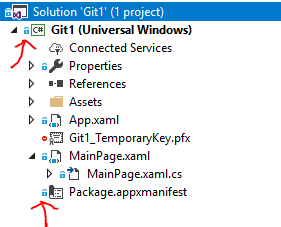 If we check it, the new project will be associated with Git and we can use all related functionalities, confirmed by the presence of file status icons behind each file that is part of our solution. 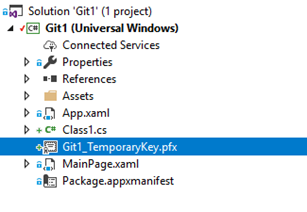 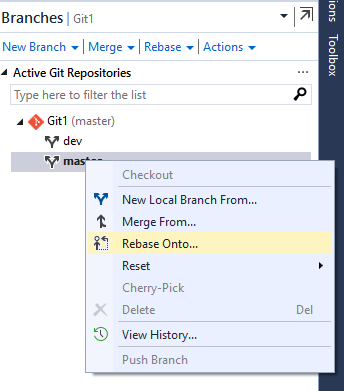 We now have our brand new project and we know we can use Git source management system with it directly from Visual Studio, in the next episodes we’ll see how.